June 14th is flag day, but only one state–Pennsylvania–observes the occasion as a legal holiday. Another interesting bit of trivia that I recently ran across stated that Betsy Ross didn’t receive credit during her lifetime for sewing the first American flag in 1776. So to honor Old Glory and the talented women who create her (past and present), I am highlighting the story of a fantastic gift I recently received. 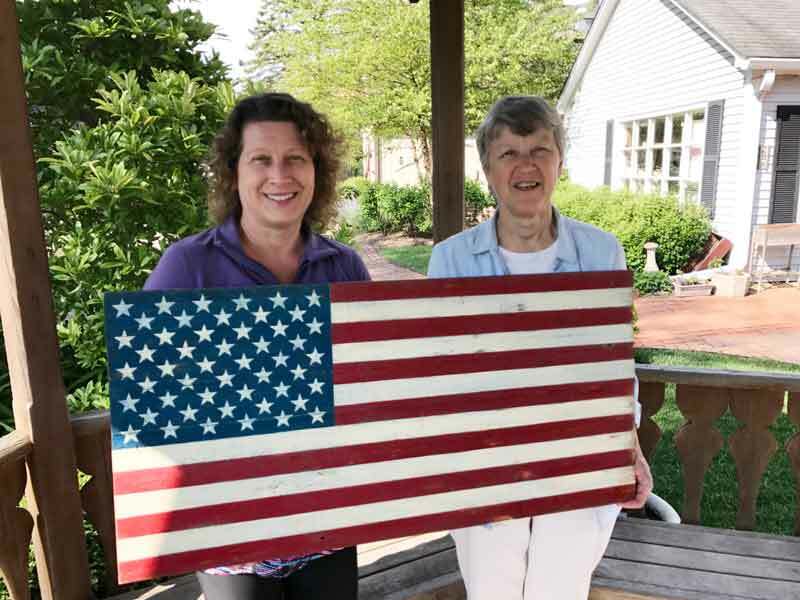 To thank me for my service as Village President, Long Grove artist and friend Marie Roth presented me with the beautiful painted wooden flag pictured above. Marie has been creating wooden renditions of the red, white and blue for many years now, and has quite a following. She was even recently featured in a national magazine! Marie’s flags are usually made out of reclaimed barn wood, and she is often on the lookout for old farm sites and other possible sources of wood with an interesting history. When she completes a flag Marie always includes a write-up about where the barn wood was found, and any stories she knows about the former owners. What makes my flag so special is that it did not come from reclaimed barn wood, but instead, from wood that was once part of our Long Grove covered bridge! During my term of elected office the covered bridge has been hit and damaged many times (too many times!) by trucks and distracted drivers. During one of the many repairs, a pile of discarded and damaged boards was left by the side of the road and after several days Marie was alerted to the find. I have often coveted Marie’s flags, and even purchased a couple for gifts over the years. Now I am delighted to have a piece of Marie’s art and a piece of the covered bridge hanging in my home to remind me of the years spent representing our Village. Speaking of the covered bridge, we are getting ever closer to having our local landmark on the National Register of Historic Places. I will be attending a meeting in Springfield later this month of the Illinois Historic Preservation Agency, who will be reviewing our application and (hopefully) making a recommendation to the National Park Service for the official designation. Keep your fingers crossed!